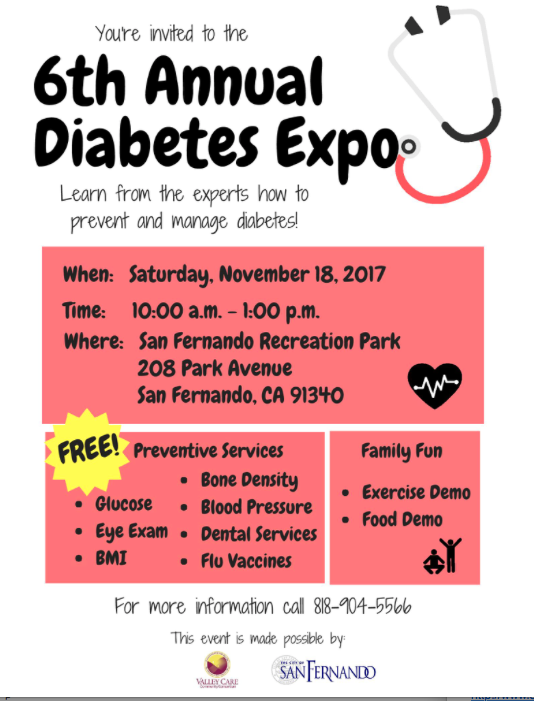 You are invited to the 6th Annual Diabetes Expo, presented by Valley Care Community Consortium and the City of San Fernando on November 18th from 10:00 am to 1:00 pm at the San Fernando Recreation Park. This is a great opportunity to learn from experts on how to prevent and manage diabetes. Free preventative services will be available to help in the fight against diabetes. These include free glucose tests, eye exams, BMI measurements, bone density checks, blood pressure, dental services, flu shots, and more! The event will also provide lots of fun to the whole family, with exercise groups and food demos for everybody. If you have any, questions, please call (818) 904-5566. We look forward to seeing you there. Join @valleycccorg and @citysanfernando Nov. 18 from 10-1 for our Diabetes Expo. #Free diabetes services and # fun available! Thanks to high fat / high carb American diet, Diabetes poses a clear and present danger or illness and death for over a third of our family, friends, and neighbors. That make Diabetes a public health crisis with the potential to harm or kill far more people annually than any natural or man made disaster.